Michael Mastandrea·was born December 22, 1922 in Jersey City. Mike was strong and solidly built as a boy, and could handle himself in a fight. That came in handy after his parents moved the family to Brooklyn in the late 1920s. Like many newcomers to working-class neighborhoods, he was challenged by the other boys. Once they took Mike’s measure, however, he became one of the gang. Although he remained close to his Jersey City relatives, Mike was now a Brooklyn boy. During the Depression, he began boxing and by the age of 18 was good enough to go deep into the New York Golden Gloves in 1941. He combined punching power with an advanced feel for the art of boxing, understanding how to conserve his energy and make his blows count. Hoping to help out the family, Mike decided to turn pro. His ultimate goal was to become an electrician; he knew his grandparents did not approve of his boxing. In fact, initially he fought under the Irish-sounding name Mike Rea, lopping off all but the final three letters of his name in order to avoid detection. 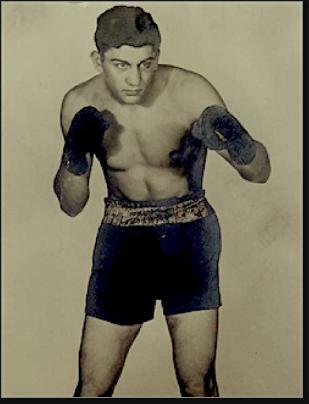 Mikewon his first pro fight against Julie Bort on May 23, 1941. Mike’s little secret was discovered in the run-up to his bout with Lou Angelo. The local newspapers in Hudson County made a big deal our of Mike Rea’s “homecoming” to Jersey City’s Grotto Auditorium, publishing his image and talking about his old neighborhood. His grandfather was so furious that he made Mike sleep in the hallway outside his apartment before the fight (which he won). The following spring, Mike faced Rocky Graziano. He stunned the 23-year-old Graziano with his quickness and strength, tearing open his lip. The more experienced Graziano recovered and overpowered Mike, knocking him out in the third round. Later that year, he scored an impressive win over Al Barbosa in Madison Square Garden. Over the next 9 months he fought 18 times. Mike was drafted into the army near the end of 1942. He volunteered for paratrooper training, which paid an extra $50 a month. Meanwhile, he continued to box in the service, scoring wins over a number of talented opponents, including Rudy Davila. He also won his regiment’s welterweight title. Mike boxed in exhibitions after the 82nd Airborne was transported to England in advance of the D-Day invasion. In the early morning of June 6, 1944, Mike’s unit boarded a C-47 cargo plane with the mission of parachuting behind the Normandy shore defense in support of the Channel invasion force. Before the jump light lit, the plane was hit by enemy fire. Several men were killed instantly, and all but three of the remaining soldiers—Mike included—perished when the pilot attempted to crash land. He was just 21. In his 36 professional fights, Mike won 17, lost 10 and had 9 draws. Mike's mother lived into her hundreds. She received his $50 death benefit each month for more than six decades. In 2017, Mike was posthumously enshrined in the New Jersey Boxing Hall of Fame.